This music is dedicated to the upliftment of the human race through its attention to our spiritual capacity and through the heavenly attributes of down-to-earth people…. A joyful beginning to playing the Harp, BOOK ONE is best approached in the company of a trained teacher who can show you a beautiful, relaxed technique. Included here is a method for learning to read music if you have never done so before. If you can already read treble and/or bass clefs, your playing the Harp may proceed more quickly. Notes about developing new skills are systematically introduced on every page. We have arranged favourite songs from the Celtic, Classical and Folk traditions, as well as original new music. SONGS include: Greensleeves, The Water is Wide, Evening of Roses, Latin Doll, Lavender’s Blue, Minuet in G and many more. 52 pages, interspersed with quotes on Music and the Life of the Spirit. Coil-bound. $26. 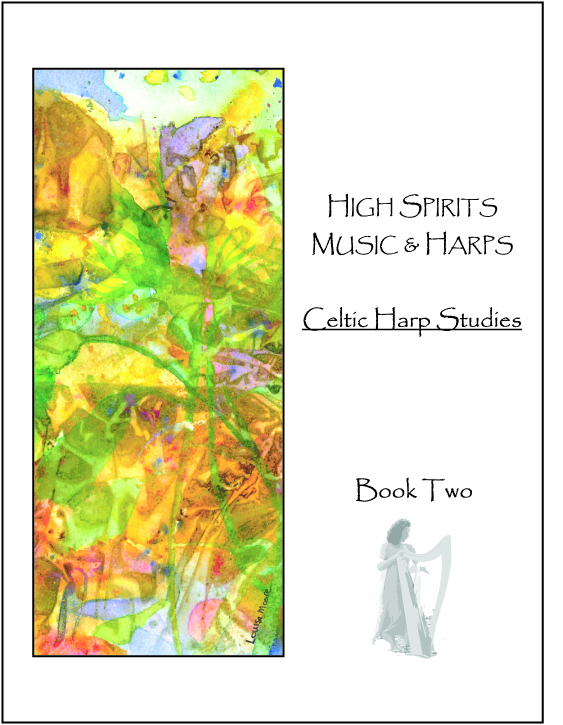 BOOK TWO is the second in the HARP CURRICULUM series. As you advance through it, the pieces become both more challenging and more beautiful, with special techniques clearly described for the student. It is preferable to use this book with a trained teacher. However, if you have already finished BOOK ONE and have some musical independence, there are plenty of technical suggestions to help you develop most of the selections on your own. SONGS include: all new arrangements of Scarborough Fair, Danny Boy, Un Canadien Errant, All Through the Night, Baloo Balilli, Mairi’s Wedding, Vidalita, Adagio by Albinoni, Pachelbel’s Canon in D, Swan Lake Theme, and many more, including exercises and studies. 74 pages, interspersed with quotes on Music and the Life of the Spirit. Coil-bound. $28. 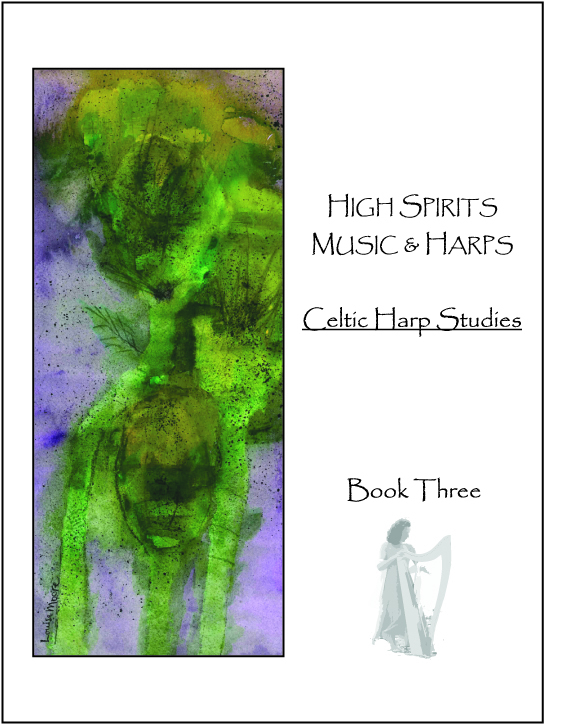 BOOK THREE in the HARP CURRICULUM series is packed with selections from every genre of music to challenge the enthusiastic student. Beginning with technical exercises for arpeggios, glorious chords, slides, cool scales and rhythmic experiments, the coordination is deepened. 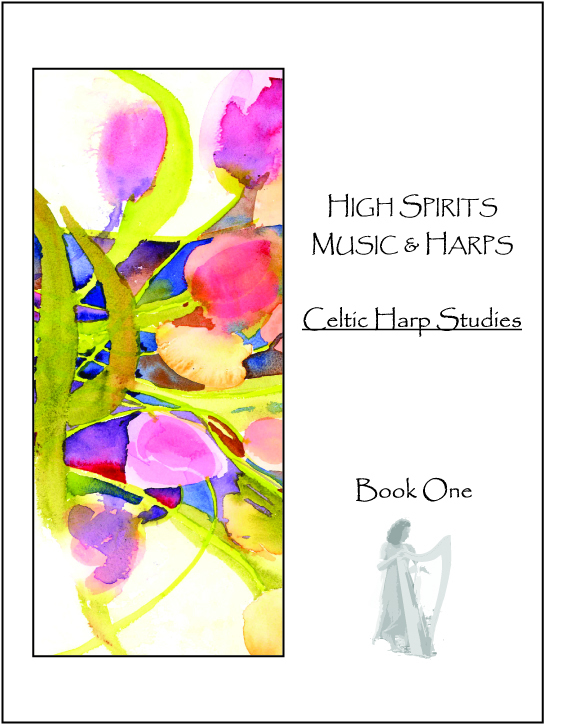 Rolled chords become second nature during this course of study, and increasingly complex arrangements of familiar tunes lead the harpist along the path of learning. In this volume are many original scores from Caroline’s own “playlist”, as well as pieces from around the musical world. SONGS include: She Moved Through the Fair, Spagnoletta, an extended Greensleeves, The Lark in the Clear Air, The Gaelic Blessing, Swallowtail Jig, two Galopas, Hava Nagila, Largo from Winter, Jesu Joy of Man’s Desiring, O’Carolan’s Quarrel with the Landlady, Jupiter from Holst’s The Planets, Clair de Lune excerpt, Okanagan Summer Storm, and many more. 89 pages, interspersed with quotes on Music and the Life of the Spirit. Coil-bound. $30. Copyright © 2019 High Spirits Music - All Rights Reserved | | Built by FACT Computer Services co.